Hey everyone! I am still recovering from vacation and getting ready for the upcoming school year, so I am thrilled to have another great guest blogger here today! 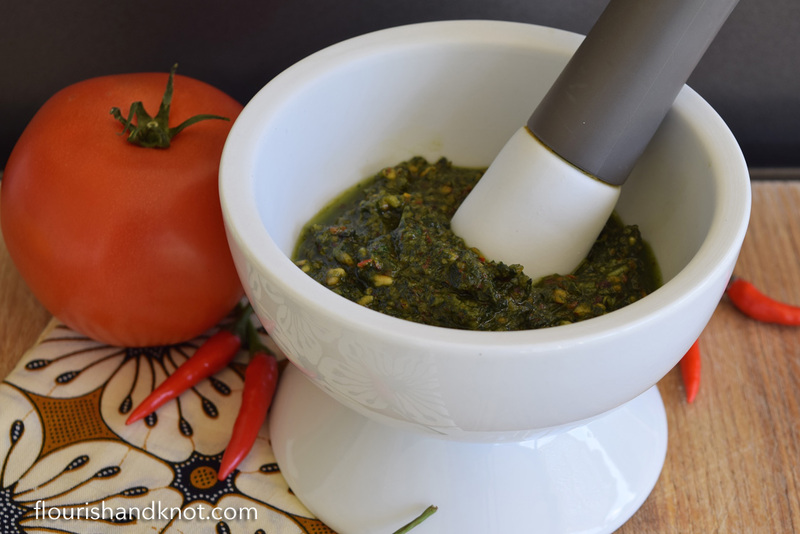 I love her version of pesto that doesn’t break the budget, like so many pestos do! Please welcome Sarah! Hi there! My name is Sarah and when I’m not cooking and DIYing, you’ll find me blogging at Flourish & Knot. I began blogging as a way of chronicling my adventures as a first-time homeowner, and it quickly became a regular outlet for my creative projects. Flourish & Knot runs the gamut of make-it-yourself: crafts, recipes, home decor, sewing, gardening, floral arranging, and entertaining. If I can do it myself, it’s fair game! 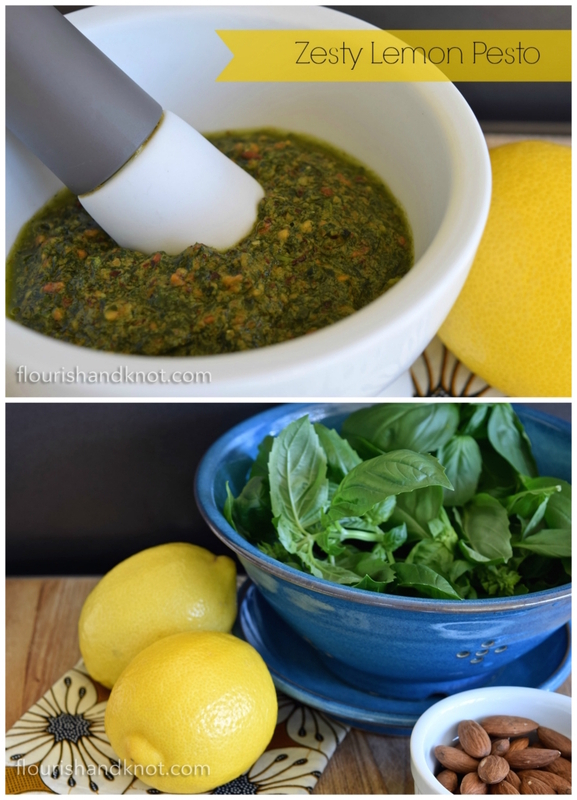 I want to thank Amanda for inviting me to share my recipe for a yummy and zesty lemon pesto with you, her lovely readers. You’ll be happy to hear this this pesto is actually budget-friendly, too! Traditionally, pesto is made with pine nuts, but at well over $12 a container at the grocery story… ain’t nobody got funds for that! My recipe uses toasted almonds instead, and it is every bit as delicious. Toast the almonds on a baking sheet at 350°, turning once until they are lightly toasted and aromatic. In a food processor, combine all the ingredients – except the salt and pepper – and blitz until the ingredients are minced very finely. You may need to stop and scrape down the sides periodically. Season to taste with salt and pepper. Blitz once more to incorporate the salt and pepper. And now here’s the awesome extra bonus feature! 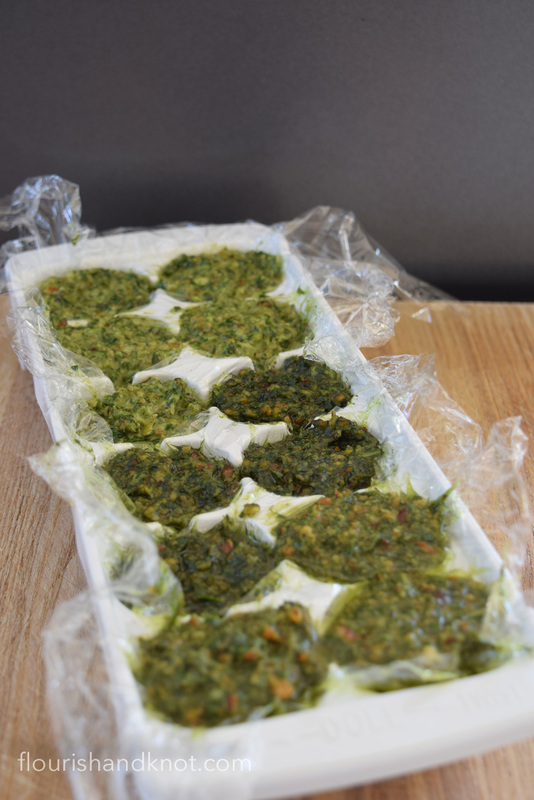 Pesto keeps for several months in the freezer, but because it has such a good strong flavour you don’t need much of it in a dish, so you won’t want to freeze it all together. Are you ready for it? Drumroll, please……. Freeze it in an ice cube tray for super-easy portion control. Once the cubes are frozen, just pop them out, wrap them well in plastic wrap, and pop ’em in a ziplock bag! Thanks again to Amanda for allowing me to contribute to Old House to New Home. I would love it if you’d take a moment to check out my blog, Flourish & Knot. Happy cooking! 1/4 cup of toasted almonds skins on is a-ok! In a food processor, combine all the ingredients - except the salt and pepper - and blitz until the ingredients are minced very finely. You may need to stop and scrape down the sides periodically. This pesto looks so tasty. I’ve never thought of adding the lemon, but it is probably refreshing and wonderful. I am going to try this next week on our pasta night. Yes! Lemon makes everything even more delicious, I think! It is so bright and zesty!